Mikael Kingsbury (left) celebrates winning gold after the men's moguls qualifying at the 2018 Winter Olympics in Pyeongchang. On the right, Tessa Virtue and Scott Moir after winning the gold medal in the ice dance, free dance figure skating final at the 2018 Winter Olympics in Gangneung, South Korea. It is a generally accepted rule of the press box that sportswriters do not fight among themselves about sports. You may speak of sports. You may offer an opinion on sports. But you do not sit down to dinner alongside your colleagues and begin talking columns at them. It’s annoying and no one cares. They’ve created a forum for that sort of thing – the internet. No one needs more internet in their real lives. This reasonable accommodation is lifted once each year for voting on the Lou Marsh Trophy. A bunch of Canadian sportswriters and broadcasters get in a room and go at each other over who should be named Canada’s top athlete of the year. It’s like The Purge for people who’ve seen too much hockey. This year’s discussion was about two hours long. The bulk of it was devoted to the definition of the word “athlete.” This proves the way to tilt any conversation toward epistemology is to hold it around a large, wooden object – say, a boardroom table – and allow people to rest their elbows while vigorously pointing. The object of contention was Olympic ice dancers, co-gold medalists and international sweethearts, Tessa Virtue and Scott Moir. This may be the first time either has caused a problem, however inadvertently, in their lives. Are Virtue and Moir, collectively, an “athlete”? Neither can compete without the other. Their accomplishments are identical. They may call themselves a “team,” but they are not a team in the way that 25 interchangeable guys make up the Toronto Blue Jays. They are a unit of athleticism, two parts constituting one whole. If Virtue and Moir are technically a team, then so was Jacques Villeneuve and the guys who ran out onto the track to change his tires. And Villeneuve won this award in 1995. There followed the sort of discussion that would never happen in a press box – people waving around old news clippings, notes they’d prepared in advance and delivering statistical analysis. It got so heavy that the writings of Milt Dunnell were read aloud. Doing so inside the Toronto Star building, where this meeting is held, is like referencing Thurgood Marshall in front of the U.S. Supreme Court. Much was made of historical precedent – three “teams” have previously won the Lou Marsh, including two figure-skating pairs, though only one in the past 54 years. Someone said “hard cases make bad law” and everyone stopped for a moment to admire how civil and learned we were being about this. But despite a lot of elbow-leaning and thoughtful pointing, Virtue and Moir – who would probably have won – were excluded on the basis that no “team” may be considered. Apparently, discussions on this topic had been held beforehand and the matter decided. We were free to vote for either Virtue or Moir, but not the two as a pair. In protest, some voters – including The Globe’s sports editor, Shawna Richer – submitted blank ballots. This was going very La Marseillaise, very fast. The argument would gutter and then flare back up. A general walkout was mentioned, but only in a theoretical way. The group did discuss the possibility of further discussions on this matter, at a time to be determined by yet further discussion, but by then everyone was exhausted and they’d started serving sandwiches. So I wasn’t clear on where we left that. As is usual at this event, I was swimming not just against the current, but diagonally and straight into a rock. I stumped for the most accomplished tennis player this country has ever produced, Daniel Nestor. I will not give my speech to you again here (12 Grand Slam titles! ), but I could tell by the glazed look in my colleagues’ eyes they were very moved by it. It was pointed out this award is given based only on accomplishments the preceding calendar year (Nestor had a down season and recently retired); and I maturely decided from now on to only vote for racehorses. My guy didn’t make the final five – freestyle skier Mikaël Kingsbury, golfer Brooke Henderson, curler Kaitlyn Lawes, figure skater Kaetlyn Osmond and hockey’s Connor McDavid. This is the point at which it must be said that “We shouldn’t take anything away from the winner” – Kingsbury. And we shouldn’t. Kingsbury isn’t just the best in the world at skiing moguls. He is very likely the best ever. He took part in 11 major events in the past season and won nine of them, including the Olympics. He finished second in the other two. That’s not just a good year for a Canadian. It’s close to the best year any athlete anywhere had doing anything. So hooray for Kingsbury. You never know how much this award means to people – some of those who’ve won it can’t be bothered doing a phone interview once they find out; and some others have never let go of losing it – but I hope it gives Kingsbury some joy. It’s well deserved. That said, it should have been Virtue and Moir. They provided Canada’s great collective moment of athletic celebration in 2018, stringing it out over several unforgettable days at the Olympics in Pyeongchang. 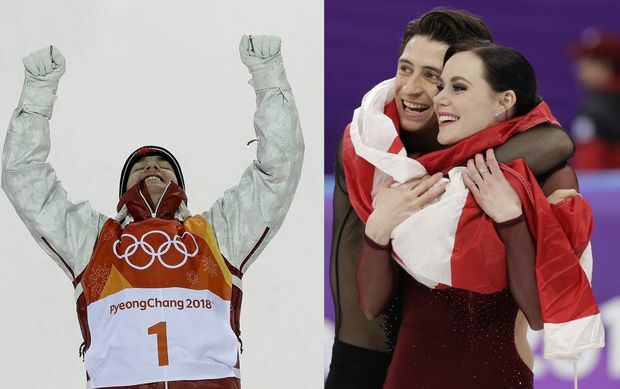 Virtue and Moir became, for an instant, the most internationally recognized Canadians on Earth. They weren’t just Olympic famous. They were Celine Dion famous. Also, like Kingsbury, they may be the best ever at what they do. That combination is, for me, a clincher. You could say their disqualification is tragic in some very small way, but that would suggest the opinions of sports journalists matter. History will be kinder to Virtue and Moir (and, one hopes, to all the others mentioned herein, each of whom did us proud). In actuality, this may be the most fitting result. Canada’s top athletes denied their laurels on a point of bureaucratic procedure after an achingly polite argument ended in an agreeable compromise. What could be more Canadian?